Fashion loves a runway debut. For Fall 2017, by the end of Paris Fashion Week, you begin to lose count of how many there were. One that sticks out in particular from Paris is Antonin Tron’s Atlein. Founded in 2016, Tron is another one of Nicolas Ghesquière’s Balenciaga disciples scattered around Paris. 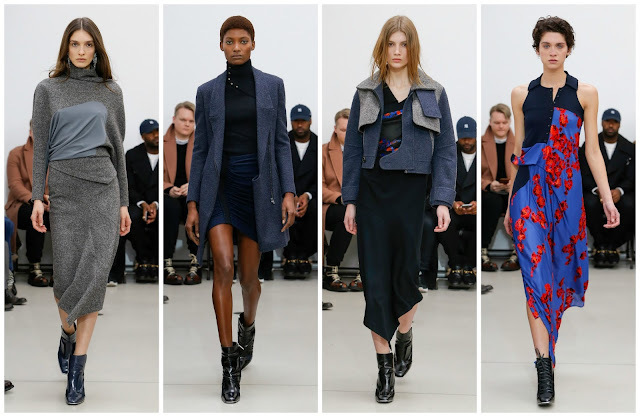 (There’s Julien Dossena at Paco Rabanne.) Tron continues to freelance there under current artistic director Demna Gvasalia, and prior to that with Alexander Wang. Other credentials include womenswear stints at Givenchy and Louis Vuitton. To say he knows a thing or two about luxury would be an understatement. Following trends has never been Tron’s motivation. Instead, he wants to build consistency in his design handwriting, citing Rick Owens and Azzedine Alaïa as designers he respects. One detected traces of Rick Owens in this collection, but the most interesting part about Atlein is identifying Tron’s signatures ones that he was responsible for during the past three tenures at Balenciaga. His construction of a dress, for example, is reminiscent of Ghesquière-era, whereas the coats point to Wang. Tron’s affect on fashion has been noticeable. His stockists include Net-a-Porter and Bergdorf Goodman, with both retailers carrying his wares in the brand’s nascency. He was the recipient of the First Collection Prize at the ANDAM Awards in 2016. 2017 sees him vying for €300,000 and mentorship in the LVMH Prize—he competes against industry darlings Molly Goddard, Richard Malone and Charles Jeffrey’s Loverboy. Tron has plans and he knows what direction he’s wanting to head in. He is a purveyor of jersey but his attitude towards formalwear and sportswear is proof of why he’s nominated for the prestigious prize. “I will gradually introduce other lines of products as I carry on constructing my house.” This is just the beginning.